In response to the World Boxing Council’s (WBC) September 2016 Quarterly Report, twenty-eight year old professional boxer, Demetrius “Boo Boo” Andrade (Providence, Rhode Island/pro record: 23-0, 16 KOs) has questions about his current status as it relates to his participation in the WBC Super Welterweight Division Tournament. A-Team Promotions understands that the boxers involved in the tournament will be able to interact with the WBC Board of Governors at the WBC’s 54th Annual Convention Meetings, to be held at The Diplomat Resort & Spa in Hollywood, Florida, December 11-17, 2016, to ensure their continued participation in this tournament. In response to the report, Demetrius Andrade stated, “There is some confusion on behalf of A-Team Promotions, with regard to the WBC’s recent report about my involvement in the Super Welterweight Division Tournament. Some of that confusion arose from part of the WBC’s statement, which inferred that my team changed the terms of a proposed fight agreement, so that my fight with Hatley couldn’t take place. A-Team Promotions was not aware of that situation. That same WBC report revealed that I became the second mandatory when I beat Willie Nelson by TKO12 on June 11. The report incorrectly stated that I signed to fight for another organization, and that my case will be reviewed at the WBC convention. I have not signed to fight for another organization, so what exactly will be reviewed at the convention in December? It is my team’s understanding that I am still a participant in the WBC Tournament. If this is not true, then my team respectfully requests for the WBC to grant us an opportunity to remedy the situation in advance of December’s WBC convention meetings in Florida. 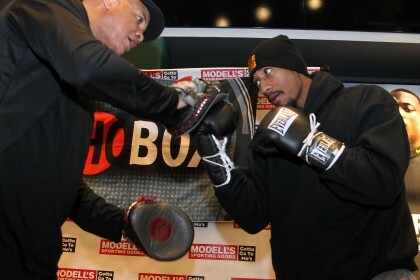 Team Andrade boxing trainer Paul Andrade said, “Our team is set on Demetrius fighting the winner of Charlo-Hatley. Artie Pellulo presented us with the opportunity to fight Jack Culcay. We asked Artie if taking another fight outside the WBC tournament would prohibit us from further participation. Artie informed us that he would get permission from the WBC to fight Jack Culcay, and that fighting him would not jeopardize our standing in WBC Tournament. Artie then relayed to us that we had been granted permission from the WBC to fight Culcay, and that our standing in the WBC Tournament would not be jeopardized. With the understanding that we had permission to make the fight, we went forward with negotiations to fight Jack Culcay.